I figured out the secret to making a muffuletta taste as good in Maine as it does in New Orleans. It's not hard at all! Every Foodie has to make a pilgrimage to the Central Grocery in New Orleans and taste one of their muffuletta sandwiches. Legend has it that the muffuletta was created in this very spot in 1906. If you expect all New Orleans food to be French or Creole, you are wrong, the Central Grocery was an Old-World Itlalian deli and still has that vibe going today. You might therefore think that you can make any old Italian hoagie and call it a muffuletta. No you can't. 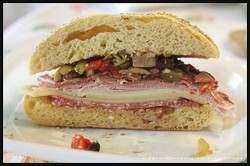 A muffuletta is always served on a round roll. It then uses authentic Italian mortadella (Italian salami) turkey, ham and cheese. In order for it to taste like it came from the Central Grocery Co., you have to use their olive tapenade spread. The first time I ate a muffuletta sandwich, I wasn't prepared for how unique it would taste. My mother was born in a small village outside of Bologna, so I knew authentic mortadella (Italian ham) when I taste it. Imported mortadella from Bologna was only the first secret. I concentrated so hard on sussing out the ingredients in my muffuletta that the manager came over to put me out of my misery! As I suspected the ingredients were all very high quality. The round bread with rye seeds was particularly beguiling. However, I had eaten all of these ingredients since my childhood and they never tasted this good. 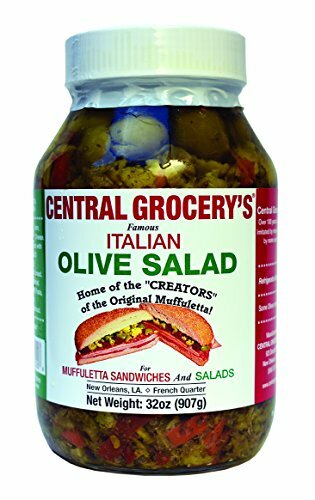 The secret is the Central Grocery Co. Italian Olive Salad. Inside the Central Grocery Co.
What's in the Central Grocery Olive Salad? What's in this magical olive salad spread? Well not surprisingly it starts with green pimento olives and kalmata olives. While the folks at the Central Grocery were happy to tell me what was in it, they didn't give amounts or brands. Both of those affect taste. Then they add minced garlic, capers, celery, carrots, pepperocini, cauliflower, and cocktail onions (those are hard to find in Maine!). More spices include celery seed, oregano, basil, and black pepper. Moisten it with red wine vinegar, olive oil and canola. I have tried for years and never gotten mine to taste like their's. The price might seem a little steep, but it's a huge jar and lasts for weeks. It's great flavoring for other sandwich (especially egg salad) and even some soups. I've been to New Orleans, but somehow missed the muffuletta. Next time . . . Grown in only 20 Georgia counties, Vidalia onions are sweet and flavorful. They prized as gourmet onions around the world. Honeybells are the Holy Grail for citrus fruit lovers. They are only available in January and come from a small region in Florida.